7 tips on how to secure basement windows and window wells to help create a more safe and secure home. Jen: I remember the uneasiness I felt around window wells as a child, as if my falling down one was an inevitable fact. Mercifully, my fear was never realized, but as I began renting basement apartments as a young adult, my concern shifted from the danger of tumbling into a six-foot spidery abyss to the danger of a burglar breaking and entering through my vulnerable basement windows. Window wells pose a unique challenge for homeowners because they present both a safety risk and a security risk. Thankfully, there are several things you can do to your window wells to prevent burglary and ensure the safety of the children and small animals who frequent your yard. The first thing you can do to tackle both safety and security is to install a grate over your window well. While something is better than nothing, we’ve seen a lot of people place flimsy pieces of plywood or plastic covers over their window wells. These may work okay as short-term solutions, but small children typically aren’t good judges of durability and may try to stand on a surface that can’t hold their weight. Plastic covers are also more prone to weathering and cracking and are easier for thieves to remove without drawing much attention to themselves. You’ll want something that fits snugly onto the well, without a lot of extra space for fingers to get pinched or for a prying tool to get leverage. Keep an eye out for a rust-resistant coating that protects the grate from weathering and rust that weakens metal over time. Check the weight limit, which is especially important if there will ever be children, pets, or even wild animals in your yard. Look for a grate that you can open from the inside, so you can easily exit the basement through the window well in the event of an emergency. Depending on the quality of your windows, the manufacturer’s locks may be quite flimsy. Consider replacing them or even adding additional locks, such as a pin lock or a padlock. For sliding windows, pin locks are relatively inexpensive and easy-to-install options that could present enough of an obstacle that a burglar may move on. You install the pin lock where the two panes overlap. You can remove the pin can to open the window or insert it to keep the window from being slid open. This 3 ½-inch pin lock, available on Amazon, features a chain so that the pin won’t be lost when not in use, and the pin itself is long enough that it can’t be wiggled out when inserted. Padlocks can be a cost-effective option for securing small, non-exit windows. We would hesitate to put a padlock on an emergency exit window because if there’s a fire in your basement, you don’t want to add another second to your escape. If you decide to go this route on a smaller window, however, consider our top padlock recommendations. Store the key nearby so you can locate it easily, but place it out of reach for someone who manages to break a window pane. You’ll also want to pick up and install something to attach the lock to, such as this zinc-plated Stanley hasp, available on Amazon. You have a few different options for reinforcing the glass of the window itself, depending on your needs and budget. 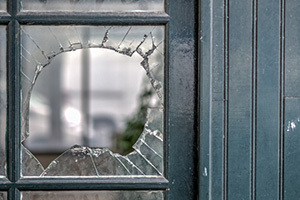 Security film, sometimes called window laminate, is a relatively low-cost way to deter intruders because, while it can eventually be broken or cut, it presents enough difficulty that most burglars will move on. If someone attempts to break a window with film on it, you may have to replace the window itself, but you won’t have to replace your valuables. If you’re inclined to do-it-yourself projects, complete DIY window film kits are available on Amazon in a variety of sizes that can also be cut to fit your windows. For smooth, successful installation, you should make sure your surface is as clean as possible before you begin. If you’d rather avoid risking the bubble effect you’ve likely seen in poorly installed car window laminate, hire a professional. If you have small basement windows that don’t need to be used as emergency exits, consider replacing them with glass blocks. Much thicker than traditional windows, glass blocks are extremely difficult to break, and not many house burglars will be hauling around a sledge hammer. These blocks let in plenty of light but offer privacy, which is why they’re also popular options for bathroom windows. In addition to providing security, glass blocks help insulate, increasing the energy efficiency of your home. Again, choosing DIY versus hiring a professional will depend on your own comfort level. As with any windows in your home, use shades, blinds, or other methods to keep valuables out of sight from the windows. Large, expensive electronics can, of course, be a target, but a burglar will have a considerably easier time making off with laptops, cameras, jewelry, watches, and cash sitting out in plain view. Your valuables should be hidden, but your windows shouldn’t be. While tall fences, bushes, and trees are good for your privacy, they’re good for a burglar’s privacy as well. If you have large bushes or other landscaping elements that hide your basement windows from view from the street or another house, trim the bushes or do other maintenance so that a would-be burglar can be spotted by a passerby or a considerate neighbor. Similar to an open view, having ample lighting around your basement windows makes them less appealing to burglars. Motion sensor lights may startle an intruder or even alert you to suspicious activity around your house if you’re home when they’re triggered. If you have several spaces to illuminate, a three-pack of Hallomall motion sensor lights are available under $100 on Amazon. These are weatherproof and are solar-powered, so you don’t have to buy extra batteries. Reviewers have noted that these lights stay charged even on cloudy days, but if you’d rather not go with the solar option, these Heath/Zenith battery-powered motion sensor lights are a less-expensive option on Amazon (you’ll also want to pick up two 120-Watt Max Par 38 flood bulbs, which are not included with the fixture). Window sensors will trigger your alarm system if a window is opened when it shouldn’t be. Glass break detectors will sound the alarm if their microphones pick up on the frequency of breaking glass. Indoor motion sensors, pointed at your windows, will alert your system if someone makes it past a window and into the house. Motion-sensing cameras are available for both indoor and outdoor uses and can capture a visual recording of the culprit, increasing your chances of a positive identification. Your window wells don’t have to be the weak point in your home’s security, nor do they have to pose a significant safety risk to your loved ones. Making an investment now in a few high-quality additions to your wells and their corresponding windows will save you money down the line and keep safe the things and people you love.